The equation of a line is a linear relation between two variables x and y, which is satisfied by the coordinates of each & every point on the line and not by any other point. 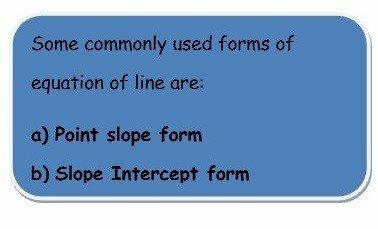 There are various forms of Equation of a line. 2x + 3y + 7 = 0 which can also be written as 2x + 3y = (-7). 4x + 3 = 7 where B = 0. 3y + 2 = 5 where A = 0. Equation of line passing from origin (0, 0) and slope 1 is (y – 0) = (x – 0) or y = x. Hence the line is given by the equation 4x – y – 1 = 0. The length of the intercept made by of a line on the Y-axis is called its y-intercept. 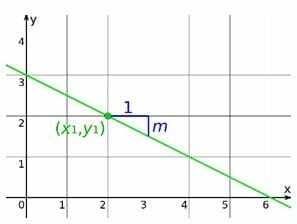 Equation of line with slope, m = 11 & y-intercept c = -2 is y = 11x – 2. 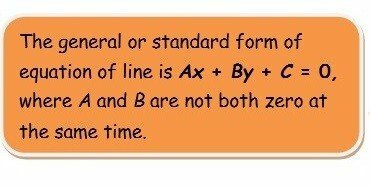 Write the equation of the line 3x = 4y + 7 in general form. Convert the equation 3x = 4y + 2 in slope intercept form. Find the equation of the line passing from origin (0, 0) and slope 4. Find the equation of the line passing from origin (1, 5) and slope -7. 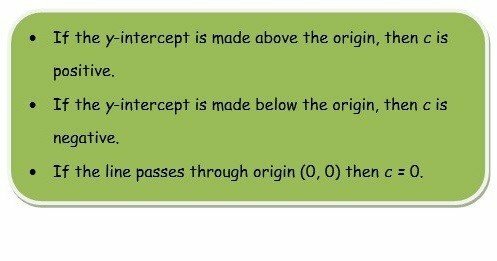 Find the equation of the line with slope 2 & y-intercept 11. 3x – 4y – 7 = 0. 7x + y – 12 = 0.
x – 5 or 3x – 7y – 35=0.